Silicon Valley can be a crazy place to work. 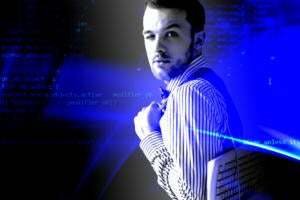 Whether you want to call it crazy or creative, these days when young guns go to the office, they want shared workstations and open spaces to collaborate. Tech companies new and old are obliging them with colorful and imaginative workspaces. 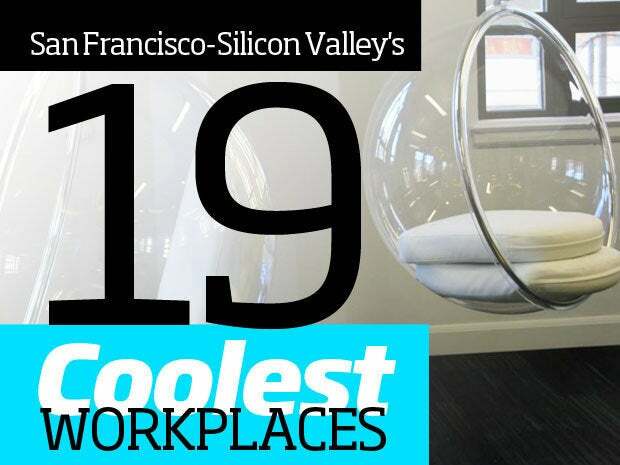 Check out 19 of the most impressive office spaces in the valley. Silicon Valley has always been a wacky place to work, but new trends are quickly turning corporate campuses into playgrounds. The next-generation millennial workforce with its flexible schedules and awesome mobile productivity tools is putting an end to the 9-to-5 cubicle workday. Now when these young guns come to the office, they want shared workstations and open spaces to collaborate. They want places to unwind. They want colorful scenes that transport them -- at least, artificially -- away from the gray corporate dystopia. Silicon Valley architecture enthusiasts have been waiting to see what Facebook's planned "West Campus" in Menlo Park on the old Sun Microsystems campus would look like. Photos were released in March showing a giant rooftop park for employees to take a stroll. That's right, actual face-to-face socializing, not the online-only version. Designed by Frank Gehry, the building should be completed next spring. After its successful IPO, Twitter is the hottest tech company right now. Here's what Twitter has to say about its sizzling San Francisco offices: "We wanted a space that accommodates movement (people can find quiet spaces to work or flock together for informal meetings) and seems spacious, without heavy furniture or fixtures. Our open spaces are configurable for gatherings or intermittent collaborations. A lightweight bird theme (found in small touches throughout the building, including original art) reinforces the idea of Twitter: an open platform that encourages flying solo and flocking." In one of the most unusual workspaces, Github in San Francisco has an Oval Office replica (currently under renovation) for a lobby. According to Custom Spaces, which helps startups and tech companies find office space, Github also has "an indoor picnic area complete with lights strung from the rafters, a 'speakeasy' bar concealed behind a wood paneled wall, an unapologetically glam ladies lounge of Wearstler proportions, and rows of 'caves' where workers can tune out their surroundings in order to focus on the project at hand." Box's office in Palo Alto has a lot of fun things, including a slippery slide, sports room and a blue room. It's clearly following the Silicon Valley office trend where brightly colored offices look like an amusement park or perhaps a night club. What's behind all the fun? 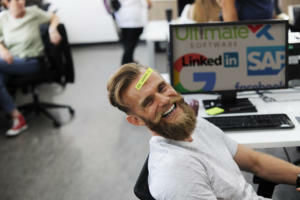 A Box spokesperson says the company culture can be summed up by its motto "bring your fun, wacky self to work." Of course, Box's planned initial public offering will bring a lot of fun, too. One of the most interesting workspaces is Dropbox's music room in its San Francisco offices. Speaking about the offices' overall look and feel, a Dropbox spokesperson says: "Dropbox's office reflects the product, simple and functional with a focus on design. It's not unusual to see team members riding skateboards through the halls covered in greenery and subtle Dropbox embellishments. There is a music room with a grand piano, and Legos can be found in conference rooms to inspire creativity." Silicon Valley companies have traditionally brought oddities into the workplace, such as the ubiquitous foosball table. 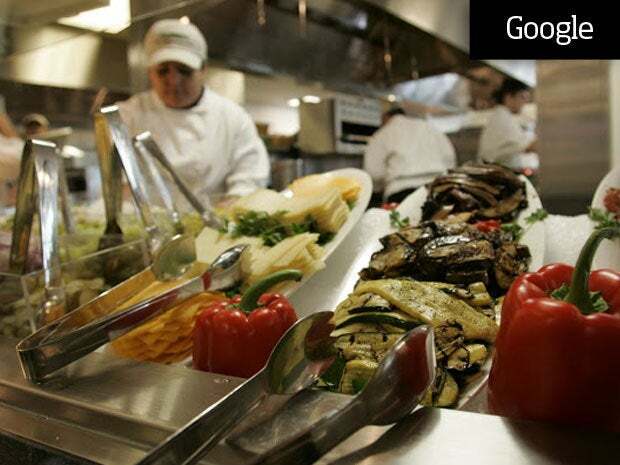 But Google took it to another level with a campus in Mountain View filled with all sorts of awesome amenities, the most famous being the Google cafeteria serving up free gourmet food. 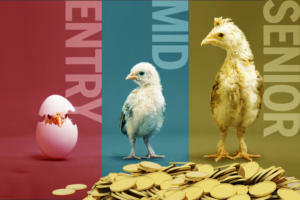 New Googlers often put on 15 pounds in their first year. In fact, you could argue that Google started the wacky workplace explosion. It makes sense that Airbnb's travel-rental mission would inspire its San Francisco offices to have an international theme. Says an Airbnb spokesperson: "How can we create the sense of travel in an office? Simply having photos of listings and far off places was not enough. It is not just about recalling the memories, but about feeling that you're there. We replicated some of the most unique places on Airbnb to create this feeling. Each room, from Milan to Reykjavik, Bali to Amsterdam, not only celebrates our global community, but also lets everyone who visits them truly experience a different place." 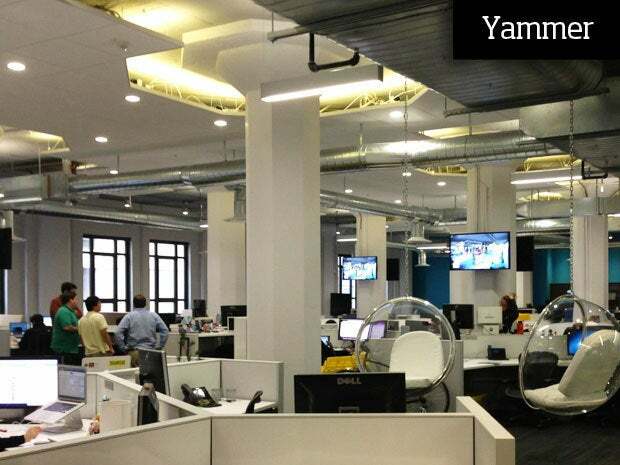 An enterprise social networking company with the name Yammer just has to have a wild workplace -- and it does. The San Francisco-based company has some fascinating furniture, such as a floating chair. There's a game room and colorful chairs in breakout spaces. We're guessing it's Yammer time. This slideshow is about wacky workplaces, and StumbleUpon in San Francisco fits right in. What's behind the office design? 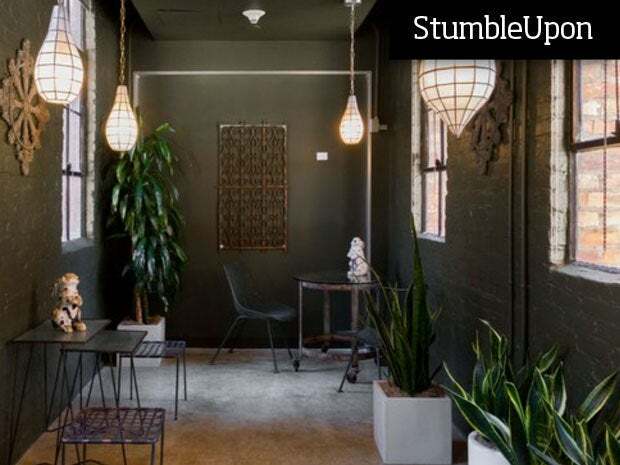 A StumbleUpon spokesperson says: "The result is a building filled with a mix of inviting furniture, earthy/industrial elements, bold pops of color, and irresistible kitsch. In keeping with the company’s focus on discovery of the Web, we accessorized rooms with items related to famous scientists and their discoveries." Asana, a San Francisco-based tech firm that makes a Web-based project management tool, is built to grow -- all the furniture is movable. Asana also takes its name from Sanskrit, meaning "easeful posture." Says Asana: "We designed our space to balance comfort and efficient communication. We have lots of open spaces, but also plenty of smaller, comfortable places to work or relax." 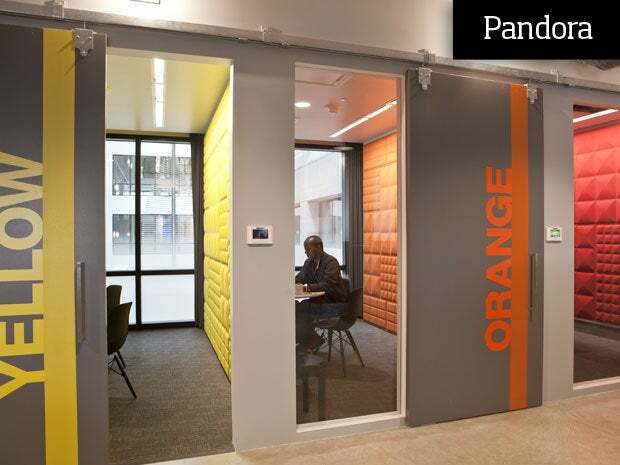 Pandora is known for serving up a variety of music over the Internet, but its Oakland offices are just as colorful, particularly its color-coded breakout rooms in green, yellow, orange, red, blue, violet, purple and indigo. Tables also fit inside giant letter blocks spelling out Pandora's core service: R-A-D-I-O. 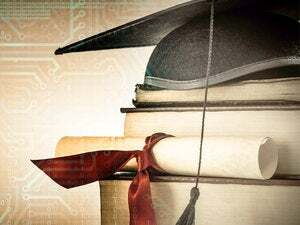 Cisco is getting into the wacky workspace movement with its new "innovation center" in San Francisco geared toward young engineers. It's an industrial open space that looks to end the era of the personalized, permanent cubicle. There's no question the younger workforce is driving this trend. They want flexible work schedules, which require shared workstations and collaborative meeting spaces. Here's what Comcast says about its new Silicon Valley Innovation Center: "Cool, muted colors prevail over the space, with vibrant pockets of red throughout. Reflecting Comcast's origins as a cable provider, the design of the space takes cues from a two-dimensional electrical wiring diagram. Red paths run across the floor using in the pattern of wires and serve as way-finding guidelines." In Internet years AOL is ancient, but the company is trying to refresh its image in its West Coast offices. Here's what Custom Spaces has to say about AOL's design: "Their design features plain industrial surfaces with punches of color, custom graphics, and a mix of exposed and textured ceilings. The result -- a design that embodies the qualities of the new AOL: transparency, collaboration, creativity, playfulness." Tech companies aren't the only ones changing their office landscape. 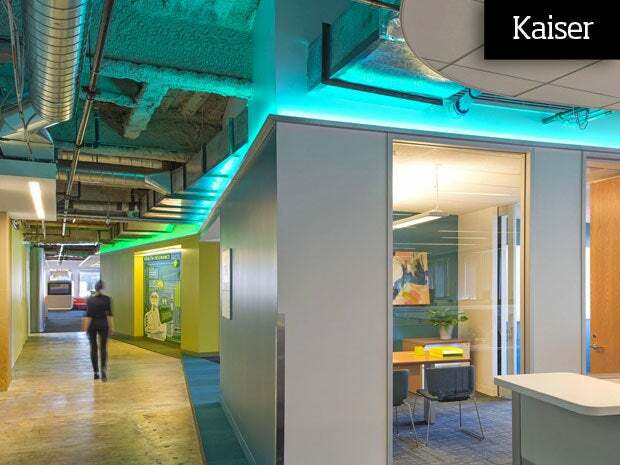 Kaiser Permanente has redesigned its offices in Oakland, particularly the ones for its IT group. 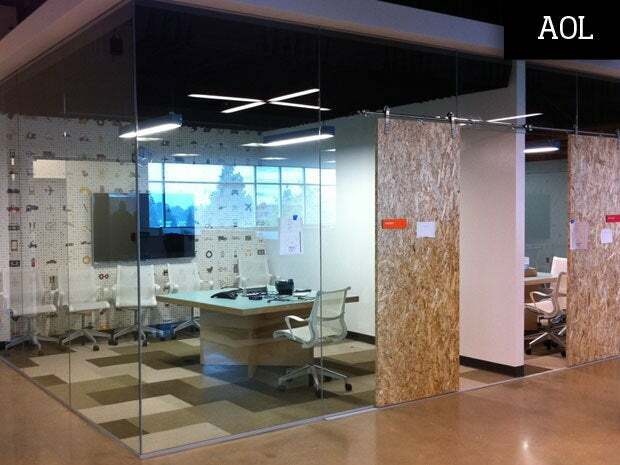 Says a Kaiser spokesperson: "The open space floor design incorporates numerous progressive features that promote greater collaboration, creativity and productivity. These features include collaboration spaces, communication rooms, centralized café, wellness rooms and quiet labs, as well as open workstation arrangements, all designed to bring energy and greater interaction to our teams." Says Path in San Francisco: "We designed Path to be the place where you share life with your closest friends and family, and we wanted our office to have that same home-like feeling. A mix of wood, metals and glass evokes the craftsman style and provides a warm, inspiring atmosphere. From the chalkboard walls for people to share ideas and express themselves to our dining area where we have our communal office lunches, our space is designed to help everyone feel free to think creatively while also working together as a team." One of Steve Jobs' last acts was presenting to the Cupertino City Council plans for an Apple campus, dubbed the "spaceship" because of its unusual circular design. The four-story campus is expected to be operational in 2016 (originally next year) and support 12,000 employees who can walk around the building and meet co-workers. 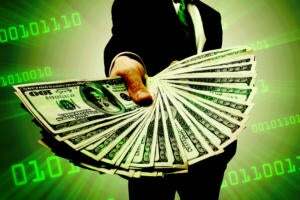 "It definitely helps define Silicon Valley's 'think different' mantra," longtime Silicon Valley designer Steve Yamaguma told CIO.com. The statue of the venerable Jedi Yoda of Star Wars fame -- an iconic site in San Francisco -- greets employees and visitors at Lucasfilm (although there are considerably fewer employees after Disney purchased the company). Master Yoda's wise and calm expression will no doubt make even the most manic of Mondays somewhat bearable. SWA Group, a landscape architecture firm in the quaint seaside town of Sausalito, Calif., knows a little something about form and function and how the creative process works. Like the other offices in this slideshow, SWA Group embraces an open workspace with no cubicles and no boundaries. Yet it also has the most work-like feel. There's a wall that acts as a sounding board for collaborative ideas and artistic projects. Can you smell the wood burning?